Former Formula 1 champion Kimi Raikkonen has agreed to race for Citroen's junior team in the 2010 World Rally Championship. The 30-year-old, who left Ferrari a year early at the end of the 2009 season, will compete in 12 of the 13 events for the Red Bull-backed team. 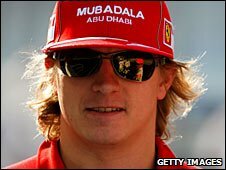 "This is a new but very exciting challenge," said the Finn, who won the 2007 F1 drivers' title with Ferrari. "We have a one-year contract and we will see how it goes for the future." The one-year deal keeps alive the chances of Raikkonen returning to F1 in 2011. After being replaced by Fernando Alonso at Ferrari, he entered negotiations with former team McLaren but failed to agree financial terms. McLaren then recruited Brawn GP's 2009 F1 champion Jenson Button to form an all-British line-up with 2008 winner Lewis Hamilton. Raikkonen was offered a contract by Toyota in October but reports claimed that deal was also scuppered by his salary demands. Less than a month later, the financially troubled Japanese car maker opted to end its involvement in F1. Raikkonen can certainly afford to take a sabbatical from F1 - he is being paid a sum believed to be in the region of 20m euros not to race for Ferrari in 2010. He made his world rally debut on home territory in August, and looked competitive before crashing out. Citroen's French driver Sebastien Loeb has won the last six world rally titles and Raikkonen will have one of the most competitive cars in the C4. Citroen said on Friday that Raikkonen's co-driver will be compatriot Kaj Lindstrom, who partnered now-retired Tommi Makinen to four successive world titles in the 1990s. France's rising hope Sebastien Ogier will drive the junior team's other car. The team will not compete in New Zealand. Loeb and Spaniard Dani Sordo will continue to drive for the main Citroen team. Team boss Olivier Quesnel remarked: "We will continue to count on Sebastien and Dani to defend our world titles in 2010.